« Je suis en France!! 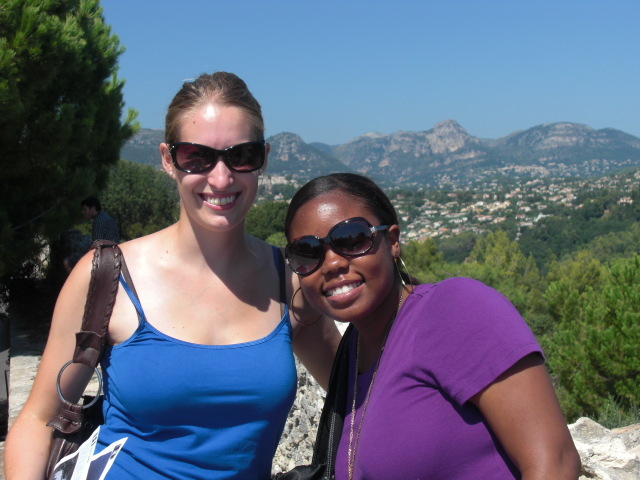 We toured “Les Villages Perches” – the perched villages – medieval villages nearby Cannes that have some of the best panoramic views. They are relatively small, and now house many galleries and small stores frequented by tourists. The views are definitely worth driving the (somewhat dangerously) small winding road up the mountain! 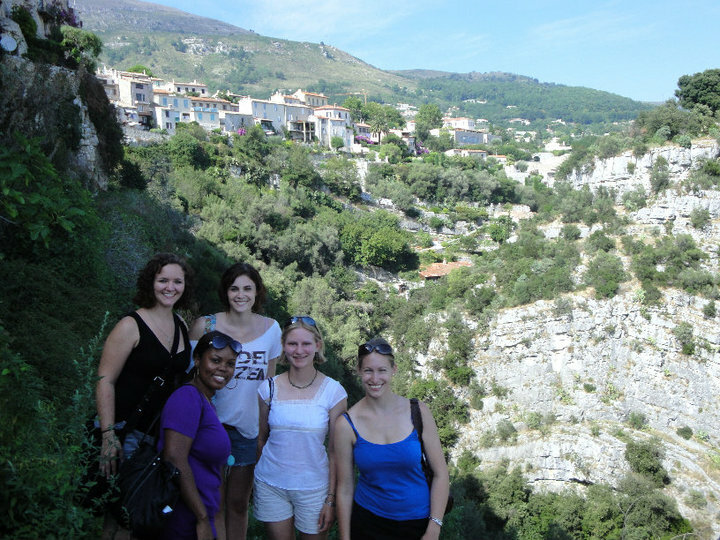 Shawn, Leah, Regina, Laura and I at Tourettes sur Loup! This village was much more quiet than St. Paul de Vence and was so idyllic I felt like I was stepping into a postcard! Yesterday we had the placement test that everyone was dreading after a 3 month hiatus from French classes. It was definitely intimidating, but we all did fairly well. We had 20 minutes for each section, which included comprehension, grammar, a short essay and an oral conversation. This morning the real work began! We met our teacher and were led to the grammar class corresponding to our placement level. This grammar class meets every morning from 9am-noon, though we have “le pause” – a short 15 minute break halfway through class. In my class, there 7 people – me, 2 other CSB/SJU students, and students from the Czech Republic, Italy, Spain, and Russia. Most of the students that come to the CIC (College International de Cannes) stay for 2-4 weeks, so our group is a big exception! However, since we will be here longer, we have more opportunities to practice and advance into the higher levels. After class ended, we had lunch (pasta with scallops!) 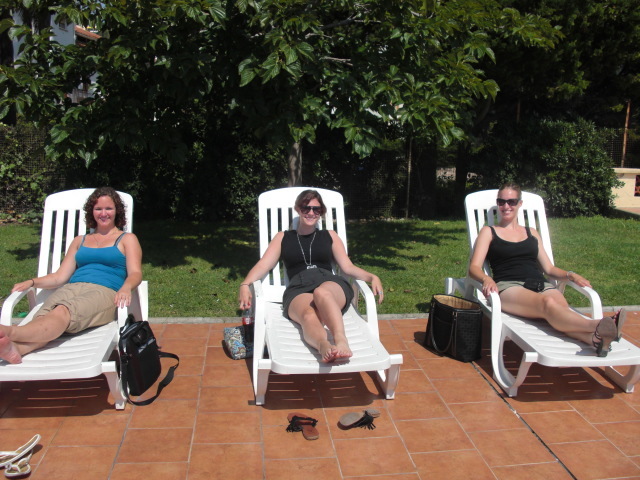 and another half hour to relax before our seminar with Beth – our CSB/SJU professor who is leading our trip as our study abroad director. She is a history professor, so her class will be about the ancien regime and the French Revolution. Should be pretty interesting – later on in the class we will be playing a game where we will each role play a figure from the French Revolution, and when we tour Paris, we will have to lead part of the tour at a site of some importance for our historical figure. 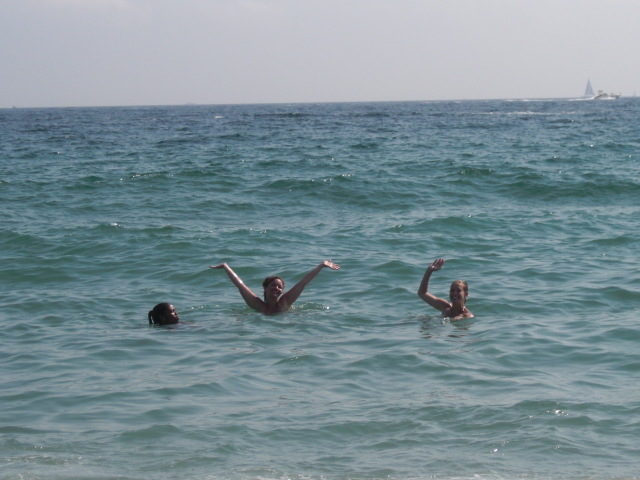 Shawn, Leah, and I swimming in the Med. Sea! Pour ma classe avec Beth – elle veut nous choisir un but pour les trois semaines prochaines – un but académique ou personnel. Je pense que je choisirai un but pour parler plus de français – peut-être je parlerai totalement en français de 8h jusqu’à midi. Je voudrais parler le français couramment, alors, j’ai besoin de pratiquer parler ! Maintenant, c’est un peu difficile, mais après un peu de temps, ce devient plus facile. Studying out on the terrace - my favorite place to do homework! That’s about it for now – A bientôt ! -there are no screens on the windows – everyone seems to have these little bag-on-wheels kind of things for carrying all sorts of things – groceries, purchases, and cats/dogs. – lots of little dogs here, but they all seem well behaved. the biggest dog i’ve seen so far was a small lab. and, dogs are allowed to be in stores and go on the bus. – they really hate mcdonald’s – though we’ve seen several. There’s a shirt I’ve seen that says McShit. – when crossing the street, you just have to put your hand out and cross, they will stop for you. better when in a larger group though. – It’s true – the french really do use their shutters on their houses. Every building seems to be tan white yellow or pink with a terracotta roof. – The pillows are one long cylinder – not a square flat pillow. – If you order eggs here in the morning, they always come with some lettuce, tomatoes, and a mushroom. – they made pizza the other night and i tried one that was 3 cheese – definitely not like at home. they use good french cheese and a pastry like crust. Nice pictures, I wish I was there. Hope your first days of school are going well for you. Love to see your posts!! So excited for you! love the pictures. soak it all in,experience everything, live it up kiddo! !